Discussion in 'Old's Cool' started by bgoodsoil, Jul 9, 2011. I've read about this and Desert Pistons is selling a wheel that's been modified in that way. Anybody know what's involved, or done it? I'm thinking of shooting Woody's an e-mail to see if he's familiar with it. Yeah, I had Buchanan do it for my G/S. They offset-drilled a blank rim for me, of the right width to run a 150 Michelin. How much offset do you want? 3-5mm is easy (cheap) with a spacer. Try it you may find 130 is sufficient. 140-150 could be overkill, slow your turn in rate and offer more lateral loading than your frame can cope with. The wider tyre does offer better wear for those long, fast, competitive desert stages if that's what you're into. Another way to get the clearance is to tweak the swingarm with a couple of bends. You only have to pay once and can run standard wheels. 2.50 " std rim (post '81) will take a 140 knobby though I'd want a 3.00" rim for a road tyre. That spacer sounds like a better first step. Can you tell me more about that? Mine's made from 3mm aluminium sheet. Bikes elsewhere atm or I'd take a photo. Disc with the centre cut out and three holes in the "rim" to take the wheel studs. 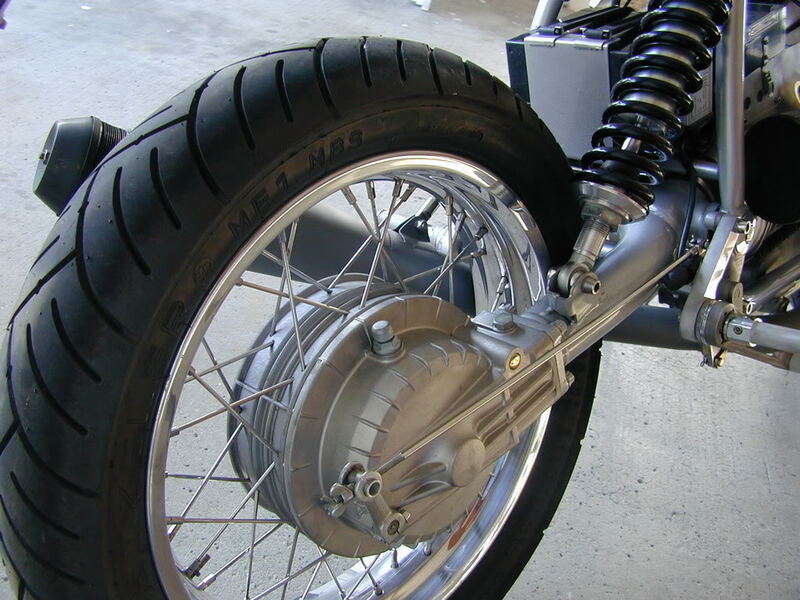 You could take a pattern with gasket paper or alfoil from the inside surface of the wheel hub. edit yep thats the sort of thing above but with 3 holes instead of 4.
any source for a spacer or do I need to make my own? 1/8" steel ought be right at 3mm. If it's as simple as making a round plate and drilling some holes I don't think it'd be difficult to knock one out. No source for a three hole spacer. It is a pretty simple fabrication. I used aluminium so any wear would be on the spacer not the hub or the stub axle. Aluminium is also lighter and easier to work and I had some lying around. oooh I love it when I get new projects! My main motivation isn't to fit a 130...it's to fit a 120! I always liked the Duros on my KLR. Super wide and super flat. I wanted to try them on the G/S but the 120 is so wide it hit my shock. That Ohlins has the aggravating trait of using a larger diameter spring. If it turns out the Duro still won't fit I can always trade it to jenna for beer. oooh I love it when I get new projects! My main motivation isn't to fit a 130...it's to fit a 120! Are the duro's unusually wide? I have TCK 120 and Ohlins on my G/S now.